Do you organize Art & Craft Shows, Fairs & Festivals? Art & Craft Show Yellow Pages is your #1 Reliable source providing detailed information about Art and Craft Shows, Fairs and Festival. The Online Show Listing System for Crafters, Artist, Vendors and Event Promoters. Rent your booth today! Get contact information to each show NOW! Get Detail information about each show easy and fast with our copywriting quick code format. Read your show listings on the GO! Optional Print-on-demand book! The Most Complete, Accurate, & Up-To-Date Show Listings, Guaranteed! Marketing Tips for Novice Show Promoters: Free and low-cost marketing tips for your event. If you'd like to print out these pages, look for the printer-friendly link on the page. Your event will be published in Art & Craft Show Yellow Pages. If you would like to submit your show listing by fax or mail please CLICK HERE to download our show listing form. To post your events on-line, on our network of websites use This Form. 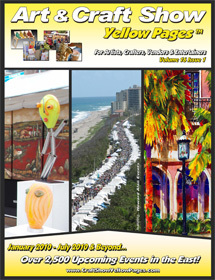 Art & Craft Show Yellow Pages ™ is now Online for only $48.95 a year! Faster and easier to find more events, Printed On-Demand for current subscribers only at $15.00 Each Print (Includes Priority S & H). Click Here to Browse Our Online Database of Events for Sample Event Listings - Now Nationwide! Sell your arts and crafts at Fairs & Festivals. Find out where the shows are and start selling at local, state and nationwide events. Sell at farmers markets, sell your art at street fairs, sell food at festivals, sell clothing at craft shows, sell jewelry at street fairs and more. We list all events Nationwide! We include detail verified information for each event! This is the best source for event information and is ideal for vendors looking to sell their products or services whether you are selling food, promotional items, clothing, antiques, jewelry or any items ranging from hand made to buy and sell. Subscribe NOW and get instant access to the most reliable event listing information you can count on! Art & Craft Show Yellow Pages is a regional show guide for craftsmen artists, food vendors and resellers in Alabama, Arkansas, Connecticut, Washington DC, Delaware, Florida, Georgia, Iowa, Illinois, Indiana, Kentucky, Louisiana, Massachusetts, Maryland, Maine, Michigan, Minnesota, Missouri, Mississippi, North Carolina, New Hampshire, New Jersey, New York, Ohio, Pennsylvania, Rhode Island, South Carolina, Tennessee, Virginia, Vermont, Wisconsin and West Virginia ! Art & craft show listings contain in-depth details and information to help you choose the right shows to sell your arts and crafts, promotional items, food vending, trade or wholesale. All shows are not equal. Choose your shows by targeting your customer. Will your customer be there? We even publish information such as: 3 stages of live music, pony rides, Antique and Classic Car Shows,. . . - more! Real show listings with detail descriptions like, event attendance, cost of booth, size of booth, what you can sell at each event or signup deadlines to event. Choose from detailed listings according to your preferences; we let you know if a show is indoors, outdoors, in tents, or in a mall. We even publish eligibility requirements, - so you will know if a show is an 'Open Show' a 'Juried Show' or trade or wholesale shows. If a show is predominantly Contemporary, Traditional, or Country , we print that information too, to help you find the right venues to sell your work. ART and CRAFT SHOW YELLOW PAGES is the most important tool in your business kit! Subscribe with confidence! We guarantee it will help you with your business, or we'll refund the balance of your subscription!